As mentioned, in mammalian CME the GTPase dynamin is believed to play important roles in invagination and clathrin-coated pit (CCP) maturation . Its binding partners endophilin and amphiphysin, can also induce tubulation of the vesicles and have been shown to copolymerize with dynamin . It has been suggested that constriction of the rings may be sufficient to pinch off the CCVs from the plasma membrane , however, it is generally accepted that additional factors or forces will contribute to promote scission. In support of this is evidence indicating that in the presence of GTP, dynamin will undergo a twisting action and subsequently apply a longitudinal tension on the tubule that results in its breakage . 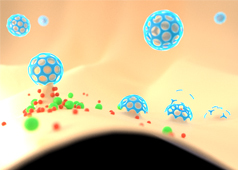 A similar observation was made during experiments using lipid nanotubes containing PIP2. 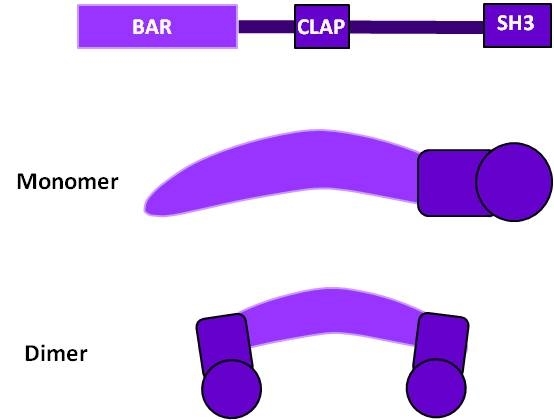 The functional regions of amphiphysin are the N-terminal BAR domain which is required for dimerization and membrane binding, and the middle domain which is responsible for clathrin and adaptor binding (CLAP). Amphiphysin is thought to recruit dynamin for vesicle scission in clathrin-mediated endocytosis. In this case dynamin was observed to form a molecular spring that underwent conformational changes (from compressed to relaxed) in the presence of GTP. It was proposed in this study that vesicle scission would result from dynamin pulling the membrane inward and finally breaking the tubule . In shorter tubules or bud necks however, it has been suggested that additional factors may be required to promote vesicle scission . Scission and dynamin accumulation is known to correspond to an abrupt decrease in PIP2 levels, and this has been attributed to the recruitment of Synj1 by the BAR domain proteins . Mathematical modeling demonstrates that the site of scission will be at the phase boundary where the amount of PIP2 decreases sharply . It has been postulated that this depletion of PIP2 results in a weakened hydrogen bond network in the upper part of the budding membrane whilst a strong hydrogen bond network remains in the lower part of the budding membrane. A subsequent imbalance in surface tension results . Also impacting membrane tension, and possibly contributing to vesicle scission, is the actin cytoskeleton. It has been shown that polymerization of the actin cytoskeleton is not crucial for vesicle scission in all cells; however, a high level of co-ordination was reported.